Leishmania amazonensis induces a nonhealing infection in C3H mice, whereas infection with Leishmania major is self-healing. We found that C3H mice infected with L. amazonensis exhibited decreased IL-12 production, which could account for the susceptibility to this organism. However, exogenous IL-12 administration failed to induce a healing immune response. The failure of L. amazonensis-infected C3H mice to respond to IL-12 was associated with a specific defect in IL-12 receptor β2 (IL-12Rβ2) mRNA expression by CD4+ T cells. Furthermore, decreased IL-12Rβ2 mRNA expression correlated with a decrease in the IL-12-signaling capacity of the lymph node (LN) cells. IL-4 did not contribute to susceptibility or down-regulation of the IL-12Rβ2 subunit, because IL-4−/− mice remained susceptible to L. amazonensis infection, even after IL-12 administration, and CD4+ cells from infected IL-4−/− mice also had reduced expression of IL-12Rβ2 mRNA. These results demonstrate that regulation of the IL-12 receptor, independent of IL-4, is a point of control for the immune response to leishmaniasis. In contrast to experimental L. major infections, where host genetics control susceptibility, these studies demonstrate that the lack of IL-12 responsiveness may be dictated by the pathogen, rather than the host. Experimental infections in mice with protozoan parasites belonging to the genus Leishmania have been used to better understand immunity to this parasite, and to define factors that contribute to T helper cell development. Leishmania major infection in some inbred mouse strains, such as C3H and C57BL/6, is associated with a dominant Th1 response and a healing infection, whereas BALB/c mice develop a Th2 response and are unable to control parasite replication (Refs. 1, 2 ; reviewed in Refs. 3, 4). Several studies indicate that after L. major infection, susceptibility and resistance are determined by the differential expression of IL-4 and the IL-12R (5, 6, 7). Thus, L. major-infected C3H mice up-regulate the IL-12R but fail to produce IL-4 (7, 8). In contrast, cells from BALB/c mice rapidly produce IL-4 after L. major infection, which inhibits IL-12R expression and ensures that Th2 cells will dominate (5, 6, 7). However, administration of IL-12 to BALB/c mice at the time of infection blocks the IL-4 response, up-regulates IL-12R expression, promotes Th1 cell development, and results in a self-limiting infection (5, 6, 7, 9, 10). Taken together, these studies suggest that IL-4 is a critical cytokine in determining susceptibility to Leishmania, although recent results with BALB/c IL-4-deficient mice indicate that additional factors may also contribute to BALB/c susceptibility (11, 12). Experimental murine infections with Leishmania amazonensis provide a different view of susceptibility to leishmaniasis. This parasite, as well as the related organism Leishmania mexicana, induces a nonhealing infection in mouse strains that are resistant to L. major, such as C3H, C57BL/6, and C57BL/10 (13, 14, 15, 16, 17). Although these mice have a susceptible phenotype, the immune response cannot be readily defined as a Th2 response. For example, immune cells from C57BL/10 mice chronically infected with L. amazonensis produce low amounts of IL-4 and IFN-γ during infection. In addition, neutralization of endogenous IL-4 fails to promote lesion resolution, suggesting that the susceptible phenotype is not due to the induction of an IL-4-driven Th2 response (15). These results support the hypothesis that susceptibility to L. amazonensis is due to a failure to mount a Th1 response, rather than the development of a Th2 response. Th1 cell development is dependent on the presence of IL-12, as well as the ability of T cells to respond to IL-12 (18, 19, 20, 21). The IL-12 responsiveness of the T cell population has been shown to be dependent on the expression of functional IL-12 receptors. The IL-12R is composed of two subunits, termed IL-12Rβ1 and IL-12Rβ2, which are both required for IL-12 signaling (22, 23, 24). Recent studies using cells from DO11.10 TCR transgenic mice indicate that after activation Th1 cells express both subunits of the IL-12R, whereas Th2 cells express the IL-12Rβ1 chain but not the IL-12Rβ2 chain of the receptor (18, 19). In this in vitro model of T cell activation, IL-12 and IFN-γ promote maintenance of IL-12R expression, whereas IL-4 inhibits expression of the IL-12Rβ2 chain of the receptor, although IFN-γ can prevent the loss of the IL-12Rβ2 subunit in the presence of IL-4 (18, 19, 20). In this study, we investigated whether a deficit in IL-12 production or IL-12 responsiveness is associated with susceptibility in C3H mice to L. amazonensis. We found that cells from L. amazonensis-infected mice produced low concentrations of IL-12 when compared with those from L. major-infected mice and that they fail to express a functional IL-12R. Furthermore, we found that IL-4 deficient (IL-4−/−) mice on a C57BL/6 background had reduced expression of the IL-12Rβ2 subunit and failed to heal after infection with L. amazonensis, demonstrating that during L. amazonensis infection, decreased IL-12R expression was not linked to IL-4 production. Thus, these studies suggest that the susceptibility of mice to L. amazonensis is due to the absence of a functional IL-12R on the CD4+ T cell population and that this response is mediated in an IL-4-independent manner. Female C3HeB/FeJ mice (5 and 6 wk of age) were obtained from The Jackson Laboratory (Bar Harbor, ME) and maintained in a specific pathogen-free facility. IL-4−/− mice were generated on a C57BL/6 background by Dr. Manfred Kopf (25) and generously provided by Dr. Edward Pearce (Cornell University, Ithaca, NY). Mice were inoculated with 5 × 106 stationary phase promastigotes in 50 μl PBS in the hind footpad. Lesion size was monitored with a dial micrometer and expressed as the difference in footpad thickness between the uninfected foot and the infected foot. L. amazonensis parasites (MHOM/BR/00/LTB0016) and L. major parasites (MHOM/IL/80/Friedlin) were grown to stationary phase in Grace’s insect cell culture medium ( Technologies, Gaithersburg, MD) with 20% FBS, 2 mM glutamine, 100 U penicillin per ml, and 100 μg streptomycin per ml. Stationary phase parasites were washed three times in PBS before use in infections. Freeze-thaw leishmanial Ag (FT-ag)4 was obtained from stationary phase promastigotes washed four times in PBS and adjusted to a concentration of 109 organisms/ml. Parasite suspensions were then submitted to three freeze-thaw cycles of −70°C and 37°C and then stored at −20°C. The parasite burden of infected footpads was determined using a limiting dilution assay as described (15) and expressed as the negative log parasite titer. IL-12 was a generous gift from Genetics Institute (Cambridge, MA) and was used at 0.2 μg in 50 μl PBS per injection in the infected footpad. Mice received injections of 0.2 μg three times per week. This treatment regimen promotes resistance to L. major in BALB/c mice (Fig. 2⇓) and leads to more rapid healing in resistant C57BL/6 mice (our unpublished observations). Some mice were treated with IL-12 for the first 2 wk of infection, for the second 2 wk of infection, or for the first 4 wk of infection. Some mice were also treated with anti-TGF-β (Genzyme, Cambridge, MA; a generous gift of Dr. Chris Hunter, University of Pennsylvania, Philadelphia, PA) by three intralesional injections (80 μg/injection) during the first 2 wk of infection as previously described (26). Control animals received a similar amount of normal mouse Ig. Draining LN cells were obtained from mice at the end of the course of infection, as indicated in the figure legends. Cells were plated in complete tissue culture medium (Dulbecco’s minimal essential medium containing 4.5 mg of glucose/ml, 2 mM l-glutamine, 100 U penicillin-6-potassium/ml, 100 μg streptomycin/ml, 25 mM HEPES, and 5 × 10−5 2-ME) as described previously (27), and the cells were incubated in medium only or stimulated with 1 × 106 parasite equivalents of FT-ag per ml. Supernatants were harvested after 72 h, and IFN-γ and IL-4 levels were measured by ELISA. ELISA assays and IL-12p40 and IFN-γ enzyme-linked immunospot (ELISPOT) assays were performed as described (27). Single cell suspensions of draining LN cells from mice infected for 2 wk with L. amazonensis or L. major were harvested and plated in complete tissue culture medium at 5 × 106 cells/ml with FT-ag at 1 × 106 parasite equivalents/ml. Cells were incubated for 3 days at 37°C and then replated at 10 × 106 cells/ml with 1 ml/well and a total of 3 wells/group. The cells were then rested at 37°C for at least 1 h. Staurosporine (Sigma, St. Louis, MO) was added at 0.5 μM final concentration to one well for 1 additional h. The staurosporine-treated well and one additional well were then treated with IL-12 at a concentration of 1 ng/ml. Cells were incubated for 30 min at 37°C. Nuclear isolation was then done on all wells using a procedure based on the isoosmotic/Nonidet P-40 lysis protocol by Dyer et al. (28). Briefly, cells were washed in PBS and resuspended in 100 μl wash buffer (0.32 M sucrose, 3 mM CaCl2, 2 mM magnesium acetate, 0.1 mM EDTA, 10 mM Tris (pH 8.0), 5 mM NaF), and then 100 μl lysis buffer was added (wash buffer plus 1% Nonidet P-40). Nuclei were pelleted at 2500 rpm, and the supernatant was collected (cytoplasmic extract); the pellet of nuclei was washed once with 500 μl wash buffer and then resuspended in 40 μl low salt buffer (20 mM HEPES (pH 7.9), 25% glycerol, 1.5 mM MgCl2, 0.02 M KCl, 0.2 mM EDTA, and 5 mM NaF). High salt buffer, 15 μl (same as low salt with 2.0 M KCl), was then added, and the nuclei were rocked at 4°C for 20 min. Diluent buffer, 55 μl (20 mM HEPES (pH 7.9), 25% glycerol, 0.1 mM EDTA), was then added, and the nuclei were pelleted by centrifugation at 12,000 rpm in a microfuge for 20 min and the supernatant was then frozen at −80°C. All buffers had a final concentration of 10 μg/ml leupeptin, 1.0 mM DTT, 0.5 mM PMSF, and 0.1 mM sodium orthovanadate. All chemicals were purchased from Sigma. Nuclear and cytoplasmic extracts were then run on a 7% PAGE and transferred to nitrocellulose membrane using the semidry blotting apparatus from Bio-Rad (Hercules, CA). The membrane was blocked with 5% nonfat dry milk in PBS 0.1% Tween. Anti-Stat4 Ab (C-20, Santa Cruz Biotechnology, Santa Cruz, CA) was hybridized to the membrane overnight at 4°C at a 1:10,000 dilution. The membrane was then washed and hybridized to a secondary donkey anti-rabbit Ab conjugated to hydrogen peroxidase (Amersham, Piscataway, NJ), and the signal was detected using the Pierce Supersignal Reagents (Pierce, Rockford, IL) as directed. The membrane was then stripped with 2-ME/SDS at 57°C, rehybridized with anti-Sp1 Abs (Santa Cruz Biotechnology) as above, and then hybridized with anti-MEK1 Abs (Santa Cruz Biotechnology). CD4+ T cells were enriched from the LN using positive selection at 4°C with Dynabeads (mouse CD4 (L3T4)) as directed by the manufacturer (Dynal, Lake Success, NY). The cells recovered were ≥70% CD4+ T cells. RNA was isolated from this cell population using RNA STAT-60 (Tel-Test B, Friendswood, TX) as directed by the manufacturer, and 5–10 μg of total RNA were used for RPA analysis with the mRC-3 probe from PharMingen (San Diego, CA) using the RiboQuant kit as directed (PharMingen). The signal density of the RPA-generated bands was determined with the Molecular Imager system and MultiAnalyst software from Bio-Rad. Variances in sample loading were determined by differences in the L32 signal when compared with the uninfected control sample. The signal densities of the IL-12Rβ1 and -β2 bands were then multiplied by the difference to obtain a normalized value, which was represented as a graph of arbitrary units. Competitive quantitative PCR was conducted with the pQRS competimer (provided by Dr. S. Reiner, University of Pennsylvania) using the protocol by Reiner et al. (29). Briefly, total RNA (isolated as above) was reverse transcribed with random primers and the samples were normalized for 0.0625 pg hypoxanthine phosphoribosyltransferase cDNA per 5 μl reverse transcription reaction. The amount of IFN-γ cDNA was then determined using a constant amount of competimer and varying dilutions of the normalized cDNA samples. Cell division was assessed by flow cytometry using the dye carboxyfluorescein diacetate succinimidyl ester (CFSE) (Molecular Probes, Eugene, OR) as described previously (30). Briefly, the LN cells draining the site of infection were washed in PBS, resuspended at 1 × 107 cells/ml, and incubated at room temperature with an equal volume of 2.5 μM CFSE diluted in PBS. After 5 min, 0.1 ml of FBS was added to quench the reaction. The cells were then washed in PBS followed by a wash in complete tissue culture medium. Cells were cultured in 96-well U-bottom plates with and without FT-ag; a separate Ag-stimulated well was incubated with 25 μg/ml anti-TGF-β Ab. Anti-TGF-β Abs were from Genzyme (Boston, MA) and kindly provided by Dr. C. Hunter (University of Pennsylvania). After 4 days, the cells were stimulated with PMA (50 ng/ml), ionomycin (500 ng/ml) for 4 h in the presence of brefeldin A. The cells were then transferred to 12- × 75-mm polystyrene tubes and washed with 2 ml FACS buffer (PBS with 0.1% BSA and 0.1% sodium azide). Pelleted cells were resuspended in the residual volume of FACS buffer and nonspecific binding of Ab to FcR was blocked with Fc block (anti-FcRγIII/II (2.4G2) and rat IgG) for 10 min. Cells were then surface stained with CyChrome-labeled anti-CD4 Ab or isotype control. Intracellular IFN-γ was then detected by fixing the cells in 1% formaldehyde, washing in FACS buffer containing 0.1% saponin, staining with PE-labeled anti-IFN-γ Ab or isotype control in the residual volume, and then washing in FACS buffer with saponin and again with FACS buffer only. Acquisition of CD4+ lymphocytes was performed using a FACScaliber flow cytometer (Becton Dickinson, San Jose, CA). Proliferation and IFN-γ expression on the CD4+ gated population was analyzed with CellQuest software. Our previous studies indicated that susceptibility to L. amazonensis might be associated with the lack of a Th1 response, rather than a dominant Th2 response (15). To determine whether the deficiency of the Th1-type immune response and the susceptibility of C3H mice to L. amazonensis were associated with decreased IL-12 production, we measured the number of IL-12-producing cells in LNs draining the site of infection with L. amazonensis. To compare our results with those obtained during a healing response, we also assessed the number of IL-12-producing cells after L. major infection. As shown in Fig. 1⇓A, 2 wk after L. amazonensis infection the number of IL-12-producing cells in the LN was not significantly greater than the levels observed in uninfected animals. In contrast, the frequency of IL-12-producing cells from L. major-infected C3H mice was twice that seen in LNs from uninfected mice. As a comparison, when we examined the numbers of IL-12-producing LN cells from the susceptible BALB/c strain infected with L. major, we found that at 2 wk there was a deficit in IL-12 production similar to that seen after L. amazonensis infection of C3H mice (27). The low number of IL-12-producing cells detected during L. amazonensis infection correlated with low numbers of IFN-γ-producing cells, low levels of IFN-γ in the recall response, and low levels of IFN-γ mRNA in the draining LN cell population (Fig. 1⇓, B–D). In addition, the Ag-specific recall response at 2 wk postinfection demonstrated that low levels of IL-4 were produced during L. amazonensis and L. major infections (Fig. 1⇓E). We hypothesized that the lack of IL-12 production during L. amazonensis infection was responsible for the inability of these mice to mount a Th1 response and heal. To test this hypothesis, we administered IL-12 to L. amazonensis-infected mice. In infected BALB/c mice, we found that IL-12 treatment leads to Th1 cell development and lesion resolution, as previously reported (Fig. 2⇓E) (9, 10). In contrast, IL-12 administration had little effect on the course of lesion development in L. amazonensis-infected C3H mice (Fig. 2⇓A). Moreover, we found that the parasite burden in L. amazonensis-infected C3H mice remained high over the course of the infection, with or without the administration of IL-12 (Fig. 2⇓B). In vitro cytokine analysis of Ag-stimulated LN cells from L. amazonensis-infected C3H mice showed that at 14 wk postinfection LN cells produced only low amounts of IFN-γ, when compared with LN cells from L. major-infected C3H mice, despite treatment with IL-12 (Table I⇓). An analysis of IL-4 production from these same cells demonstrated that LN cells after L. amazonensis and L. major infections produced relatively low levels of IL-4 (Table I⇓). C3H mice are unable to resolve L. amazonensis infection with exogenous IL-12. A, C3H mice were infected as in Fig. 1⇑ and one group of L. amazonensis-infected mice was treated with IL-12 (0.2 μg/injection) three times for the first 2 wk of infection (see Materials and Methods). B, At the end of the course of infection the parasite numbers were quantitated. C, C3H mice were infected with L. amazonensis, and one group was treated with IL-12 as in A, whereas another group was treated with IL-12 from wk 2 to wk 4. D, C3H mice were infected with L. amazonensis and were treated for 4 wk with IL-12. E, BALB/c mice were infected with L. major, and one group of mice was treated with IL-12 as in A. Data shown is the mean lesion size (or −log parasite titer) ± SD. Because lesion development is often delayed after L. amazonensis infection, relative to L. major, we tested whether treatment with IL-12 from weeks 2 to 4 would be more effective. As seen in Fig. 2⇑C, no difference was observed in the course of infection in control mice, and mice treated for either the first 2 or the second 2 wk of infection. We also assessed whether longer treatment with IL-12 would promote healing. Thus, some mice were given IL-12 for the first 4 wk of infection. No differences in lesion progression were observed (Fig. 2⇑D). Differential expression of the IL-12Rβ2 subunit is one mechanism involved in regulation of the response to IL-12 (18, 19). We wanted to determine whether the inability of IL-12 to promote healing of a L. amazonensis infection correlated with differences in the expression of IL-12R subunits. Therefore, we measured mRNA expression levels of the β1 and β2 subunits of the IL-12R in CD4+ T cells enriched from mice infected with L. amazonensis for 2 wk. For comparison, we measured the IL-12R mRNA expression in cells from L. major-infected mice. The results show that infection with either L. amazonensis or L. major is associated with enhanced expression of the β1 subunit (Fig. 3⇓). However, whereas IL-12Rβ2 mRNA levels in cells from L. major-infected mice were substantially increased relative to cells from uninfected mice, IL-12Rβ2 levels were low in cells from L. amazonensis-infected mice. Thus, after L. amazonensis and L. major infection, there was a 9- to 12-fold increase in the expression of IL-12Rβ1 mRNA in CD4+- enriched cells. In contrast, cells from mice infected with L. amazonensis exhibited only a 2- to 3-fold increase in IL-12Rβ2 mRNA, whereas cells from L. major-infected animals had a 12-fold increase in IL-12Rβ2 mRNA expression relative to cells from uninfected mice (Fig. 3⇓). CD4+ LN cells from C3H mice have low IL-12Rβ2 subunit mRNA expression after L. amazonensis infection. A, C3H mice were infected as in Fig. 1⇑ and cells from the draining LNs were harvested at 2 wk postinfection and pooled. CD4+ T cells were enriched using positive selection, and RPA analysis was performed as described in Materials and Methods. The results are representative of three separate experiments with five to seven animals per group. L32 is a housekeeping gene used to normalize the band intensities as discussed in Materials and Methods. B, The representative RPA experiment is shown as a graph of the normalized signal intensity as arbitrary units. To determine whether differences in IL-12R mRNA expression correlated with IL-12 responsiveness, we compared the level of IL-12 signaling in LN cells from animals infected with L. major or L. amazonensis. Cells were harvested at 2 wk postinfection and cultured in vitro with Ag for 3 days. The cells were then assessed for their IL-12 signaling capacity by adding IL-12 to the cells for 30 min, followed by isolation of nuclear extracts and assessment of Stat4 levels by Western blot analysis. We found that although Stat4 is present in cytoplasmic extracts of cells from both infections, only cells from L. major-infected animals were able to translocate Stat4 to the nucleus after the addition of IL-12 (Fig. 4⇓). Inhibition of Stat4 nuclear translocation by staurosporine, a protein kinase inhibitor, indicated that the nuclear translocation detected in cells from L. major-infected mice was phosphorylation dependent. The detection of Sp1, a nuclear protein, demonstrated that nuclear proteins are present in all extracts, and the absence of the cytoplasmic protein, MEK1, in the nuclear extracts, demonstrates that there is no contamination of the nuclear extracts with cytoplasmic proteins. Thus, based on IL-12R mRNA expression and the nuclear translocation of Stat4, we conclude that there are significant differences in expression of the IL-12R in C3H mice infected with L. amazonensis and L. major. LN cells from L. amazonensis-infected animals exhibit decreased IL-12 signaling capacity. A, C3H mice were infected as in Fig. 1⇑; the LN cells harvested after 2 wk and incubated in vitro with Ag for 3 days. The cells were then plated at 10 × 106 cells/ml and left untreated, were treated for 30 min with 1 ng/ml IL-12, or were preincubated with staurosporine (Staur) for 1 h before IL-12 treatment. Nuclear (Nuc. Ext.) and cytoplasmic extracts (C.E.) were prepared, Western blotted, and probed with the indicated Abs as described in Materials and Methods. Results are representative of five separate experiments. Because we do detect some IL-4 production in the recall response of LN cells from L. amazonensis-infected mice, we wanted to test whether the presence of IL-4 is responsible for the susceptible phenotype seen in L. amazonensis-infected mice. Therefore, we compared the L. amazonensis infection and the L. major infection in IL-4−/− mice. As shown in Fig. 5⇓A, IL-4−/− mice and the C57BL/6 control mice were both susceptible to L. amazonensis as assessed by lesion development. Moreover, nonhealing infections were associated with the presence of substantial numbers of parasites within the lesions (Fig. 5⇓B). In contrast, both IL-4−/− mice and C57BL/6 mice were resistant to L. major infection (data not shown). The lack of IL-4 did not substantially change the cytokine response seen in infected mice. Thus, when assayed at the termination of the experiment, the Ag-specific IFN-γ recall responses of cells from both IL-4−/− and C57BL/6 mice infected with L. amazonensis were low (4.74 ± 1.86 ng/ml and 3.24 ± 2.84 ng/ml (mean ± SD), respectively), whereas cells from L. major-infected IL-4−/− and C57BL/6 mice produced higher levels of IFN-γ (21.85 ± 14.41 and 29.90 ± 12.94 ng/ml, respectively). 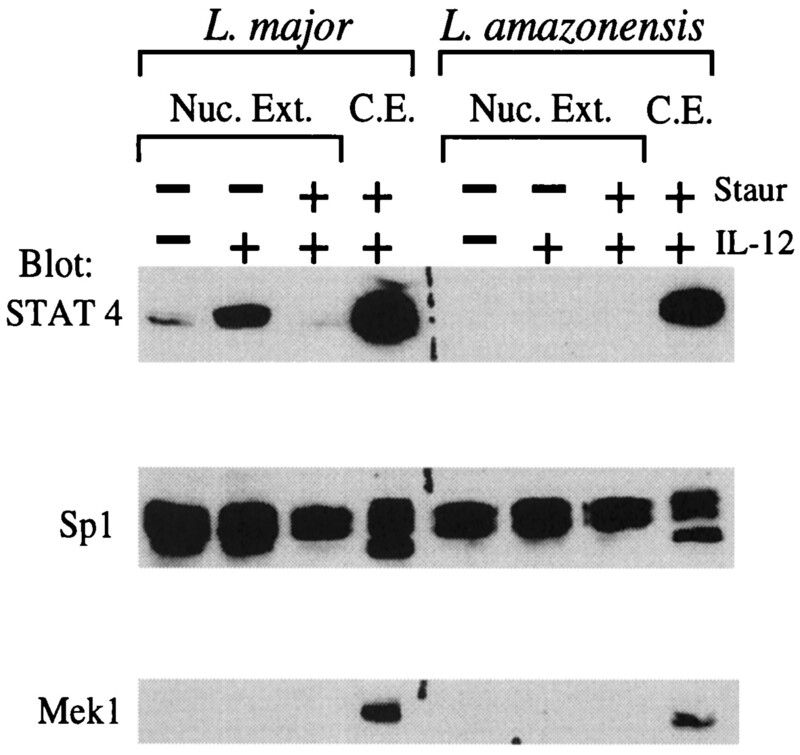 IL-4−/− mice are susceptible to L. amazonensis. A, IL-4−/− mice were infected as in Fig. 1⇑. One group of mice was treated with IL-12 as in Fig. 2⇑. The lesion size of the five mice per group was measured over time. B, Parasite quantitation was conducted for all mice as described in Materials and Methods. These results are representative of two experiments. Data are the mean lesion size (or mean −log parasite titer) ± SD. WT, wild-type control. 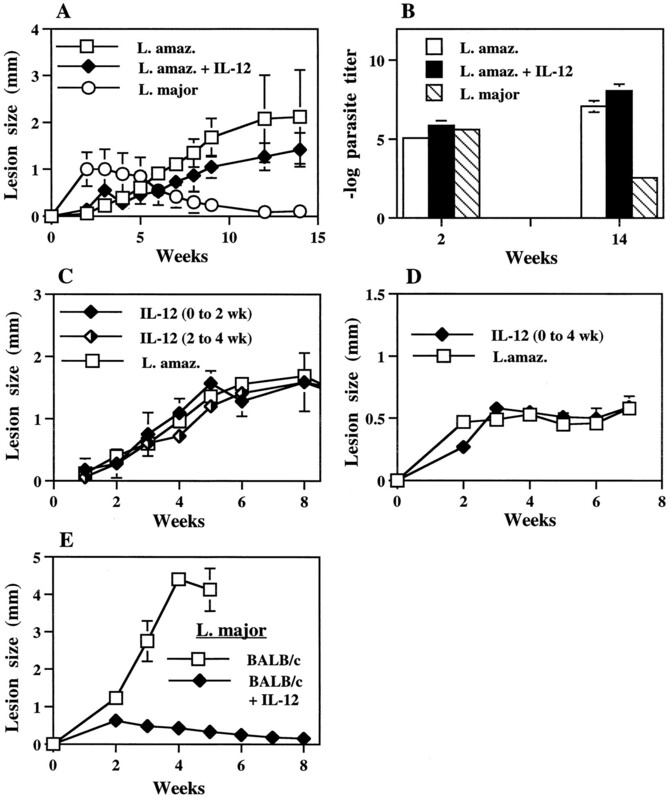 Although IL-4 may not be the only factor contributing to the susceptibility of the mice to L. amazonensis, the inability of exogenous IL-12 to resolve the infection could be a result of IL-4-induced IL-12 unresponsiveness (19). Therefore, we administered exogenous IL-12 to IL-4−/− mice during the first 2 wk of L. amazonensis infection. There was no significant increase in the IFN-γ levels detected in the recall response at the termination of the experiment (data not shown), and more importantly, exogenous IL-12 had little effect on lesion development during L. amazonensis infection in IL-4−/− mice (Fig. 5⇑A) and high parasite burdens were associated with the persistent lesions (Fig. 5⇑B). These results are similar to those seen in the C3H mice (Fig. 2⇑A). The inhibition of the IL-12Rβ2 subunit expression during L. major infection in BALB/c mice has been shown to be dependent on the expression of IL-4 during the early immune response (6, 7). The correlation of the presence of IL-4 and the inhibition of IL-12Rβ2 expression is consistent with in vitro data demonstrating a central role of IL-4 in inhibiting IL-12 responsiveness (19). Therefore, it was important to exclude a role for IL-4 in the L. amazonensis model, which we accomplished by comparing the increase of the IL-12Rβ1 and -β2 subunits during L. amazonensis and L. major infection in IL-4−/− mice (Fig. 6⇓, A and B). After L. major or L. amazonensis infection of IL-4−/− mice and C57BL/6 control mice, the IL-12R mRNA expression pattern in the CD4+ T cells was similar to that seen in C3H mice (Fig. 3⇑), although during both infections the overall increase in IL-12R expression over uninfected levels was less than that detected in C3H mice. Nevertheless, after L. amazonensis and L. major infection, there was a similar increase in the expression of IL-12Rβ1 mRNA in CD4+-enriched cells, whereas cells from mice infected with L. amazonensis demonstrated a much smaller increase in IL-12Rβ2 expression compared with L. major-infected animals. Taken together, these results indicate that IL-4 is not involved in susceptibility to L. amazonensis and that it is not responsible for modulating the expression of the IL-12R in vivo during L. amazonensis infection. CD4+ LN cells from IL-4−/− mice have low IL-12Rβ2 subunit mRNA expression after L. amazonensis infection. A, IL-4−/− and control C57BL/6 mice are infected, and the CD4+ T cells enriched from the draining LN as in Fig. 3⇑. IL-12R levels were determined by RPA analysis as in Fig. 3⇑. B, The representative RPA experiment is shown as a graph of the normalized signal intensities expressed as arbitrary units as described in Fig. 3⇑. These results are representative of three experiments. WT, wild-type control. One explanation for the differences in the IFN-γ production, as well as IL-12R expression, between cells from L. major- and L. amazonensis-infected mice may relate to decreased leishmanial specific T cell responses in mice infected with L. amazonensis compared with L. major. To define the CD4+ T cell response after infection, we harvested draining LN cells 2–3 wk postinfection, stained the cells with CFSE to uniformly label intracellular proteins, and assessed proliferation to leishmanial Ag during 4 days of stimulation by following the decrease in CFSE fluorescence intensity (30). Cells were also stained for intracellular IFN-γ, which allowed us to examine the capacity of the Ag-reactive cells to produce IFN-γ. We found that both infections were associated with induction of an Ag-specific CD4+ T cell population in the draining LN of infected mice, although CD4+ T cells from the LN of L. major-infected animals proliferated twice as well in response to Ag as cells from L. amazonensis-infected mice (Fig. 7⇓). Similarly, a lower frequency of IFN-γ-producing cells was detected after L. amazonensis infection when compared with cells from L. major-infected animals. However, by normalizing for the cells that proliferate in response to Ag, we found that the differences in the ability of the LN cells from L. major and L. amazonensis-infected animals to produce IFN-γ was not directly due to differences in the percentage of antigenic responsive CD4+ T cells. Thus, 34.4% of the proliferating CD4+ T cells produce IFN-γ after L. major infection, whereas only 10% of the proliferating cells from L. amazonensis-infected mice produce IFN-γ (Fig. 7⇓). The percentage of Ag-specific cell CD4+ T cells that produce IFN-γ is not influenced by TGF-β. C3H were infected as in Fig. 1⇑ and sacrificed 14 days postinfection. The LN cells draining the site of infection were stained with CFSE to monitor the proliferation of Ag-reactive cells. The LN cells were then stimulated with Ag for 4 days as in Fig. 1⇑. Ag-stimulated cells were incubated both with and without 25 μg/ml anti-TGF-β Ab (see Materials and Methods). After 4 days, the cells were stimulated with PMA and ionomycin for 4 h in the presence of brefeldin A. The cells were then surface stained for CD4 expression and stained for intracellular IFN-γ. The percentages shown are based on the total CD4+ gated population. The percentage of proliferating cells that are positive for IFN-γ is in parentheses below the percentage of gated CD4+ T cells producing IFN-γ. Data are representative of two experiments. We also investigated the potential role of TGF-β in decreasing IFN-γ production after L. amazonensis infection, because TGF-β has been shown to influence IFN-γ production during L. major, L. amazonensis, and Leishmania chagasi infection of BALB/c mice (27, 31, 32). Neutralization of TGF-β during the recall response led to an increase in the percentage of CD4+ T cells from the LN of infected animals that proliferated in response to Ag, suggesting that it may partially contribute to the immunosuppression seen in L. amazonensis-infected mice. However, the percentage of Ag-specific CD4+ T cells that produce IFN-γ did not increase in the presence of anti-TGF-β (Fig. 7⇑). Finally, to further explore the potential role of TGF-β in modulating IL-12 responsiveness in L. amazonensis-infected mice, we treated mice with a neutralizing anti-TGF-β mAb during the first 2 wk of infection and assessed IL-12R expression and cytokine production at 2 wk. No differences in the immune responses were observed (data not shown). Thus, we have not been able to obtain evidence for a role of TGF-β in the regulation of the IL-12R in L. amazonensis-infected mice, leaving this an open issue. In this report, we show that L. amazonensis-infected C3H mice are unresponsive to the Th1-promoting effects of IL-12. This finding is in striking contrast to that in L. major-infected BALB/c mice, where exogenous IL-12 treatment induces the development of a Th1 response and healing (9, 10). We linked the inability of L. amazonensis-infected mice to respond to IL-12 with decreased expression of a functional IL-12R, thus providing an explanation for both why IL-12 treatment was unsuccessful and why L. amazonensis induces a nonhealing infection in mice resistant to L. major. Furthermore, we found that L. amazonensis-infected IL-4−/− mice failed to heal after IL-12 administration. The inability of IL-4−/− mice to resolve L. amazonensis infection also correlated with decreased expression levels of the IL-12Rβ2 subunit mRNA compared with L. major-infected mice. Thus, our data describe an IL-4-independent pathway for leishmanial susceptibility associated with a profound loss of IL-12 responsiveness that appears to be related to IL-12Rβ2 chain regulation. Our data, demonstrating IL-4-independent susceptibility to L. amazonensis infection, are in contrast to reports showing that IL-4−/− mice are resistant to infection with L. mexicana and some L. major strains (33, 34, 35). Nevertheless, recent studies show that IL-4−/− mice remain susceptible to L. major strain LV39 (11, 35, 36) and recent experiments using IL-4 receptor α-deficient mice have shown that the susceptibility to L. major in the IL-4−/− mice can be only partially explained by the actions of IL-13 (35, 36). We have recently found that Stat6 knockout mice still fail to heal after infection with L. amazonensis, suggesting that IL-13 is not contributing to susceptibility (data not shown). Thus, there appear to be immunomodulatory factors that promote susceptibility to several Leishmania species independent of the cytokines IL-4 and IL-13. Whether these factors are similar in L. major infections in BALB/c mice and L. amazonensis infections in C3H or C57BL/6 mice will need to be determined. 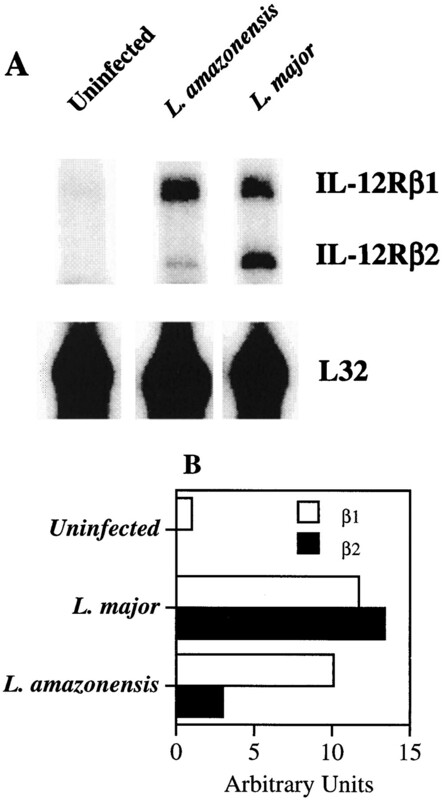 However, it is quite possible that they differ, because susceptibility to L. major in susceptible BALB/c and BALB/c IL-4−/− mice can be overcome with IL-12 administration, whereas this is not the case with L. amazonensis infection (9, 10, 37). Expression of the IL-12Rβ2 chain was a critical factor in determining the phenotype of differentiating T cells and that IL-4 was a major inhibitor of IL-12Rβ2 expression (18, 19, 20). Although recent studies indicate that expression of the IL-12Rβ2 subunit in the presence of IL-4 does not by itself switch a population of cells to a Th1 phenotype (38, 39), the expression of a functional receptor is required for Th1 cell development in leishmaniasis (40, 41). Indeed, we and others have seen differential expression of the IL-12R during the first few days of L. major infection in BALB/c and resistant strains of mice (5, 6, 7). Decreased IL-12R expression appears to be due to enhanced production of IL-4 in BALB/c mice, because anti-IL-4 treatment of BALB/c mice led to an increase in IL-12Rβ2 expression and IL-12 responsiveness (5, 6). Our current results demonstrate that during L. amazonensis infection, factors other than IL-4 can also regulate the expression of the IL-12Rβ2 subunit and subsequent responsiveness to IL-12. Recent work in the mouse has shown that IL-4-independent regulation of the IL-12Rβ2 subunit is not unique to L. amazonensis infection. 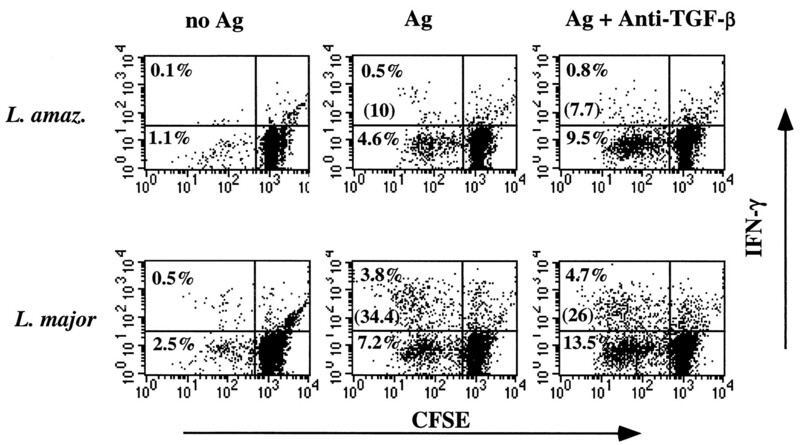 For example, administration of soluble Ags before immunization with the same Ag in CFA suppressed cellular proliferation and IFN-γ production (42). This loss of the Th1 response was accompanied by loss of IL-12Rβ2 mRNA expression on the CD4+ T cell population and was not dependent on the presence of IL-4 (42, 43). In another experimental system, retroviral expression of the transcription factor GATA-3 in DO11.10 CD4+ T cells during in vitro T cell activation inhibited IL-12Rβ2 expression and IFN-γ production in an IL-4 independent manner (44). Studies are in progress to examine whether GATA-3 is expressed during L. amazonensis infection. Several factors have been linked with susceptibility to cutaneous leishmaniasis that might contribute to the regulation of IL-12R expression after L. amazonensis infection. For example, PGE2 production correlates with susceptibility to L. major in BALB/c mice (45, 46), and is also reported to inhibit IL-12R expression (47), but the role PGE2 plays in L. amazonensis has yet to be investigated. Another factor that might contribute to susceptibility to L. amazonensis is IL-10, which is known to inhibit IL-12 production (48). However, IL-10 is probably not involved in susceptibility to L. amazonensis, because we found that IL-10 knockout mice were as susceptible to L. amazonensis as wild-type controls (our unpublished data). Alternatively, the inability to respond to IL-12 and the absence of the IL-12Rβ2 subunit mRNA could be a result of insufficient T cell activation following L. amazonensis infection. In vitro data has demonstrated that L. amazonensis amastigotes may avoid CD4+ T cell recognition by preventing MHC class II presentation of parasite derived peptides (49, 50, 51). An absence of CD4+ T cell stimulation during L. amazonensis infection could account for the decreased levels of both IFN-γ and IL-4 (Figs. 1⇑ and 7⇑, Table I⇑, and (15, 52)). However, other investigators have shown that during L. amazonensis infection, CD4+ T cells are activated and contribute to lesion development (53). More importantly, we found similar increases in IL-12Rβ1 expression in CD4+ T cells from L. amazonensis- and L. major- infected mice (Figs. 3⇑ and 6⇑), suggesting that there was an active immune response after L. amazonensis infection which is associated with a specific defect in IL-12Rβ2 expression. Furthermore, our studies demonstrate that the differences in IFN-γ production from LN cells after L. major and L. amazonensis infection is not primarily due to differences in the numbers of Ag-reactive T cells, although the percentage of these cells is less during L. amazonensis infection than during L. major infection (Fig. 7⇑). However, after normalizing for the percentage of proliferating CD4+ T cells, the results show that Ag-reactive cells from L. amazonensis- infected animals have a decreased tendency to produce IFN-γ when compared with Ag-reactive cells from L. major-infected animals. Our data suggest that L. amazonensis infection has a direct effect on the ability of Ag-specific CD4+ T cells to produce IFN-γ and express a functional IL-12R. The cytokine TGF-β has been reported to inhibit IL-12R expression, IL-12 signaling, and IL-12 responsiveness in vitro, although the extent of the regulation of these parameters varies with the dose of TGF-β and the species or strain of the immune cells that are studied (54, 55, 56, 57). TGF-β has also been shown to suppress resistance to L. amazonensis infection in BALB/c mice (31), and during the early immune response, LN cells from L. major-infected BALB/c mice increased production of IFN-γ when treated with anti-TGF-β (27). Similarly, IFN-γ production was limited by TGF-β during the recall response of liver-derived immune cells from L. chagasi-infected mice (32). More recently, both IFN-γ production and the percent of T cells expressing IL-12Rβ1 and -β2 were regulated by TGF-β during the recall response of PBMCs isolated from tuberculosis patients (58). Interestingly, in vivo depletion of TGF-β during L. major infection of BALB/c × C57BL/6 F1 mice did not alter IFN-γ levels, but resistance to the parasite was accompanied by increased inducible NO synthase expression (26). In our system, neutralization of TGF-β during the in vitro recall response shows that this cytokine may limit the percentage of cells that proliferate in response to Ag during both L. amazonensis and L. major infections but that neutralization of TGF-β was unable to alter the percentage of proliferating CD4+ T cells that produce IFN-γ, and we did not observe an increase in IL-12 responsiveness when mice were treated with anti-TGF-β in vivo. These are negative results and should be interpreted cautiously. Nevertheless, our results suggest that TGF-β may not play a central role in limiting IFN-γ production during L. amazonensis infection in C3H mice. We have also found that concomitant infection with both L. major and L. amazonensis leads to healing of both infections, suggesting that the factors responsible for a depressed immune response to L. amazonensis do not actively inhibit or suppress resistance to L. major (our unpublished observations). The findings presented here show that L. amazonensis can evade an effective host immune response by preventing endogenous IL-12 production and preventing the development of an IL-12-responsive Ag-specific T cell population. Furthermore, in contrast to experimental L. major infections in which host genetics control susceptibility, these studies demonstrate that the lack of IL-12 responsiveness may be dictated by the pathogen, rather than the host. Indeed, human L. amazonensis infection can be associated with several forms of chronic leishmaniasis (59). Our results suggest that the ability to promote a protective immune response in patients with chronic disease may sometimes be difficult, due to a parasite-mediated IL-12 nonresponsiveness. Overall, these results indicate that during infection, the IL-4-independent regulation of the IL-12Rβ2 subunit is a possible point of control for the immune response; and our studies provide an impetus to define IL-4-independent mechanisms that regulate IL-12R expression during chronic infectious diseases. We thank Drs. Manfred Kopf and Edward Pearce for providing the IL-4-deficient mice, Drs. Joseph Sypek and Stanley Wolf (Genetics Institute) for providing IL-12, Dr. Christopher Hunter for providing anti-TGF-β mAbs, Drs. Jay Farrell and Christopher Hunter for critical reading of the manuscript and helpful discussions, and Nadine Blanchard for technical assistance. ↵1 This work was supported by National Institutes of Health Grants AI01366 and AI35914. ↵2 Current address: Department of Pathology, College of Veterinary Medicine, Iowa State University, Ames, IA 50011. ↵4 Abbreviations used in this paper: FT-ag, freeze-thaw leishmanial Ag; LN, lymph node; ELISPOT, enzyme-linked immunospot; RPA, RNase protection assay; CFSE, carboxyfluorescein diacetate succinimidyl ester. Blackwell, J.. 1988. Protozoal infections. D. Waklin, and J. Blackwell, eds. Genetics of Resistance to Bacterial and Parasitic Infection 103 Taylor and Francis, London.